The USS Jimmy Carter entered the Navy's fleet Saturday as the most heavily armed submarine ever built, and as the last of the Seawolf class of attack subs that the Pentagon ordered during the Cold War's final years. The $3.2 billion Jimmy Carter was commissioned Saturday, the first submarine named after a living ex-president. Carter, himself a submariner during his time in the Navy, was on hand for the ceremony signaling the end of an era in submarining. "The most deeply appreciated and emotional honor I've ever had is to have this great ship bear my name," Carter said in remarks prepared for the ceremony at the Naval Submarine Base New London. Carter was joined by his wife, Rosalynn, former Vice President Walter Mondale and his wife, Joan, and Stansfield Turner, CIA director in the Carter administration. 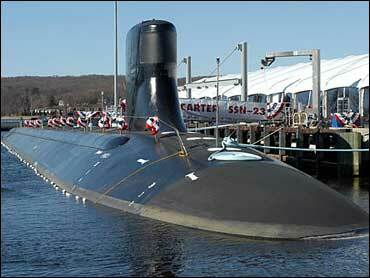 The 453-foot, 12,000-ton submarine has a 50-torpedo payload and eight torpedo tubes. And, according to intelligence experts, it can tap undersea cables and eavesdrop on the communications passing through them. It can reach speeds of more than 45 knots and carry Tomahawk cruise missiles and anti-submarine torpedoes, and it is engineered to be quieter than the other two Seawolves, making it better for surveillance. John Pike, a military analyst with globalsecurity.org, said the ceremony closes the book on the big-submarine era. "It was part of our strategy on how we were going to win World War III. It was a significant component in our response to the evil empire," he said. In eastern Connecticut, a region steeped in submarine history and the home to the Electric Boat shipyard, which built and launched the Seawolves, some fear the Pentagon will close the New London base as it looks to shrink the submarine fleet and buy smaller, cheaper subs. "It's hard to find a civilian that doesn't have some connection to the sub force," said Bud Fay, who owns a diner, car wash and laundry not far from the base gates in Groton. To ensure that the last Seawolf was not obsolete before it hit the water, the Pentagon delayed production to install a 100-foot hull extension that military analysts say equips the Jimmy Carter to replace the USS Parche, one of the fleet's premier spy subs. The Parche was decommissioned in October. The Jimmy Carter will be based at Naval Base Kitsap-Bangor in Washington's Kitsap County, the Parche's former home.